Would you wear this to a job interview? No, because it’s too informal. Would you wear this to the beach? No, because it’s too formal. In the same way, using English that is too formal or too informal for the situation can cause a bad impression. Research has shown that learning a second language, in addition to leading to expanded career and social opportunities, can also expand the reasoning capability of the brain, although this finding is disputed by some scientists. Learning another language can improve your career and social life. Some people also say it can make you smarter, but others disagree. The economy is currently quite robust; nevertheless, some specialists predict an imminent recession. The economy is very strong right now, but some specialists say we’ll have a recession soon. The client asked for a contract. The client requested a contract. The problems have come back. We will cut down on spending. The shipment has not arrived. They are manufactured in China. He’s the director of marketing. He is the director of marketing. Idiom: The software is a piece of cake. The software is quite user-friendly. The software is extremely easy to use. Slang: A million bucks in profit. A million dollars in profit. Text speak: Tks & we look 4ward 2 meeting u. Thanks, and we look forward to meeting you. The results have arrived from the lab. The results have arrived from the laboratory. Could you look over this report? She came up with a great idea. I’m available on Friday morning. This project is on the back burner. We’re operating in the red. I’m of a different opinion. / I see it differently. I don’t really care for it. Starting sentences with “but,” ending sentences with prepositions, using sentence fragments – these are all done in informal spoken English. This is one reason that watching movies and TV shows in English is difficult… even if you have good vocabulary and grammar! You may not have learned the phrasal verbs, slang, and idioms in your textbook. The Phrasal Verbs in Conversation Course and the English Idioms Course can help you learn these expressions in context! I wanna learn how to ski. I bought apples n grapes. Business English Course – Focuses on formal and semi-formal English used in meetings, presentations, interviews, letters and e-mails, and vocabulary for jobs and careers. 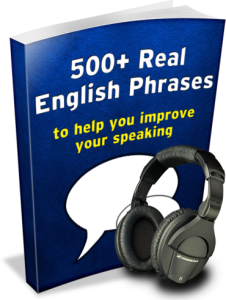 Everyday English Speaking Course – Daily situations, socializing, phrases, expressions not found in textbooks, how native English speakers say things in real life. Phrasal Verbs in Conversation – Teaches phrasal verbs in context, through dialogues, making it easier to learn and understand them. Quizzes and writing exercises help you put the phrasal verbs into practice immediately.